Start with the right tools. The right tool for the right job always makes things easier and will go a long way to ensuring success. We cannot stress enough the importance of accurate measurements. While measuring, limit conversation so you won't transpose any of the numbers. One 25-foot flat tape measure. Two acrylic square finders — These will help determine whether the corners in a closet are square in order to make adjustments. Using both squares will help you find the point where two systems need to join in a corner. Electronic measuring tool: This will help you measure longer walls more easily. Angle finder: This is critical for closets with slanted ceilings and will help you determine the angle of a dormered roofline. Sketch pad: Make sure to properly transcribe all numbers to your sketchpad, and then draw out your closet. Graph paper works best for drawing out the project to scale using these closet measurements. Closet drawing software: This is optional, but software based closet drawing tools can speed up the process of designing your new closet system. If you use a computer-based software drawing tool, you can skip drawing the closet out on graph paper, but you still need to take accurate measurements to enter into the software. If you spend some time and take accurate measurements from the very beginning, you will save a lot of time, money and heartache in the long run. Nothing is worse than getting ready to install your closet and finding that all plans must be scrapped because the closet doesn't fit the space. Always take the time to take multiple, accurate measurements of your space before attempting to design or build any type of closet system. Two key concepts that you must understand in order to ensure to accurate and successful closet measurement are hard measurements and soft measurements. This measurement is for a system that either floats on the wall or is only installed against one sidewall. This most often occurs in a walk-in closet where the system comes out of a corner. This measurement should never include fractions of an inch. 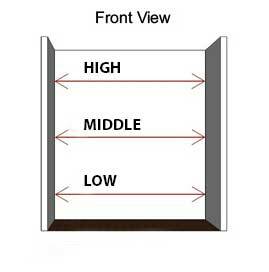 Measure the width of the wall: Measure the wall where you want to put the closet system three times using three different height locations (high, middle, low). Record the smallest measurement as your width. When taking the low measurement closest to the floor, make sure your measurement is above any baseboard. Whether you need a hard or a soft measurement will depend on your closet space. Hard measurements should be recorded to the nearest 1/4 inch. Soft measurements should be rounded down to the nearest whole number. NOTE: Be sure to use acrylic square finder to make sure all corners are square. If the sidewalls angle in, the back wall measurement should be reduced. If the sidewalls angle out, no extra deduction is needed but there will be a gap between the system and the sidewalls. Unsightly gaps can be covered with a piece of trim. Measure from floor to ceiling: Make sure the system will fit in the space height-wise. Keep in mind that the top shelf is usually installed at a height of 84 inches from the floor for a standard closet system. Heights can be planned to go higher if you have ceilings greater than 8 feet. If you want your closet system to touch the ceiling, use a soft measurement and then plan on installing crown moulding to cover any gaps. Note the depth of left and right walls, plus the type and location of the closet doors. This is to confirm that the closet design will allow for drawers and baskets to be fully opened unobstructed by doors, walls, or other obstacles. Standard depth for most custom closet components is 14 inches, which should fit with enough space to allow drawers or doors to open and clothes to hang freely in a standard reach-in closet. Note clearances: If you will be installing a system on more than one wall, confirm that the system on the adjacent wall maintains enough clearance. Hanging sections need at least 25 inches of clearance in a corner or adjacent system. Write all your measurements down: Sketch out your closet system according to the measurements you have taken on graph paper or using a software-based design tool to generate an accurate drawing. Take multiple measurements and use your measuring tools. For hard measurements, make sure to measure the closet high, middle and low, and take the smaller of these measurements and round down to the nearest 1/4". For soft measurements, round to the nearest whole number. Watch and be aware of ALL OBSTACLES. These include but are not limited to: electric panels, access panels, outlets, light switches, trim, vents, light fixtures, pocket doors, laundry chutes, and windows. Make yourself aware of all such obstacles and note them in your sketch. If it is new construction and you are designing off of a blueprint, it is imperative that you take final measurements on site once the drywall has been installed. This will help avoid any unplanned changes. Closet systems that go down to the floor look best when there are no baseboards. Baseboards do not matter for suspended closet systems that hang from the wall. However, if you do not plan to remove the baseboards on your floor based closet system prior to closet installation, note the baseboard measurements and whether or not quarter round is included. 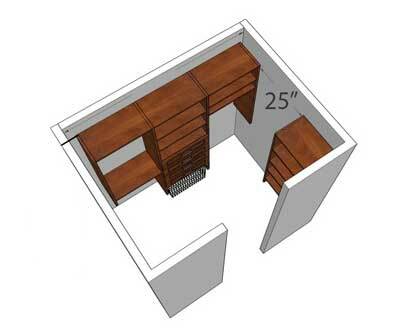 Your custom closet design can include cutouts to accommodate baseboards as long as you plan for them in advance. Drawers may also need to be raised if the baseboard is oversized. If your new closet is to include drawers against the wall, watch for door and window trim. This may interfere with the opening of the drawer. A spacer may be required to move the section away from the wall in order for drawers to fully open. If the sidewalls angle in, the back wall measurement should be reduced. If the sidewalls angle out, no extra deduction is needed but there will be a gap between the system and the sidewalls. Acrylic square finders can be used to determine the amount to deduct from the back wall measurement. After you finish your measuring, do it again to ensure all your numbers are right. Remember the age-old rule — MEASURE TWICE, CUT ONCE. Once you have your custom closet built the way you want it, you are sure to enjoy many years of organized living.